Most original hiking boots have two layers, a cushioned layer for comfort and an outer rubber sole for durability. 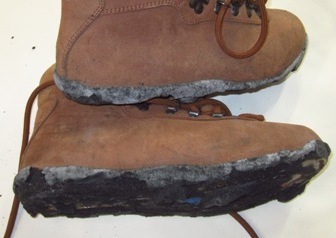 On many hiking boots that we see, the cushioned layer is disintegrating, making the boots unusable. The best way to resole most hiking boots is to remove ALL the original sole, the in-between cushioned layer and the dense outer sole. So what you have left is the bare uppers. 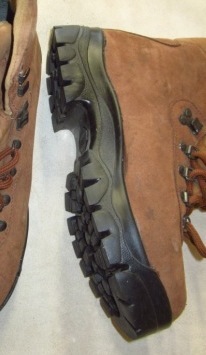 Then we replace that with a SOLID Vibram rubber sole, one that won't fall apart like so many of the originals.